The most common use of a bridge is to minimize problems caused by a missing tooth. When a tooth is lost, the teeth adjoining it may suffer from added stress. This can lead to multiple tooth loss or even erosion of the bones in your jaw. A missing tooth also causes aesthetic concerns and emotional unease. Your dentist will use the remaining teeth on either side of the gap to secure the bridge. He or she will file and shape those teeth to receive the appliance. You will receive pain blockers to ensure your comfort throughout the procedure. The dentist may also use sedatives to help you relax. 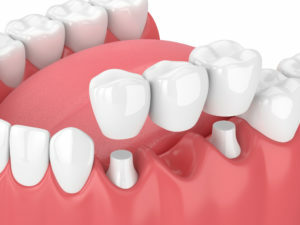 Once the supporting teeth are ready, your dentist in Daytona Beach will attach a temporary bridge using dental cement. This will enable you to enjoy your daily activities while the permanent version is being crafted at a dental lab. During your second visit, the dentist will remove the temporary appliance, fit the permanent version and check it several times to ensure a good fit. Recovery time from a dental bridge procedure is usually minimal, only a few days in most cases. Over-the-counter pain relievers are normally sufficient to manage any discomfort. You will probably want to avoid hard or sticky foods for a few weeks until you get use to using the bridge. Maintaining a bridge takes a reasonable degree of dental self-care. This includes daily brushing and flossing, eating a sensible diet low in sweets and starches and seeing your dentist for regular cleanings and checkups. When bridges fail, the cause is often a lack of proper oral hygiene. It’s especially important to avoid all forms of tobacco as well as illicit drugs if you want your bridge to last. Tobacco corrodes teeth and robs your body of the vitamins and minerals it needs to keep itself healthy. If you drink alcohol, do so only in moderation. Excessive alcohol consumption can have negative effects on your oral health. Your dentist may also advise that you avoid beverages like tea, soda and red wine, as these can sometimes stain bridges or other restorations. When properly placed and cared for, a dental bridge can last 10 years, often longer. Bridges are generally indistinguishable from your natural teeth and can restore a smile lost through tooth decay or mouth trauma. Your dentist may advise you to use a low-abrasive toothpaste to avoid scratching the appliance. A dental bridge is one way to protect your teeth while enhancing your appearance. Talk to your dentist soon about this gentle, effective form of oral therapy. It might be just what the doctor ordered to start you on the path to a better life. Dr. Renata Santeli earned her DMD degree from Nova Southeastern University. She is a board-certified Florida dentist and a proud member of the American Dental Association. You can reach her office online or by calling (386) 274-2021.